RIO DE JANEIRO – Luis Suarez exits the World Cup with one of the longest bans in tournament history, and his reputation once again in tatters. It’s the third time he’s served a suspension for biting an opponent – after similar incidents at both Ajax in the Dutch league and Liverpool in England – and the second straight World Cup where Suarez exits in disgrace. 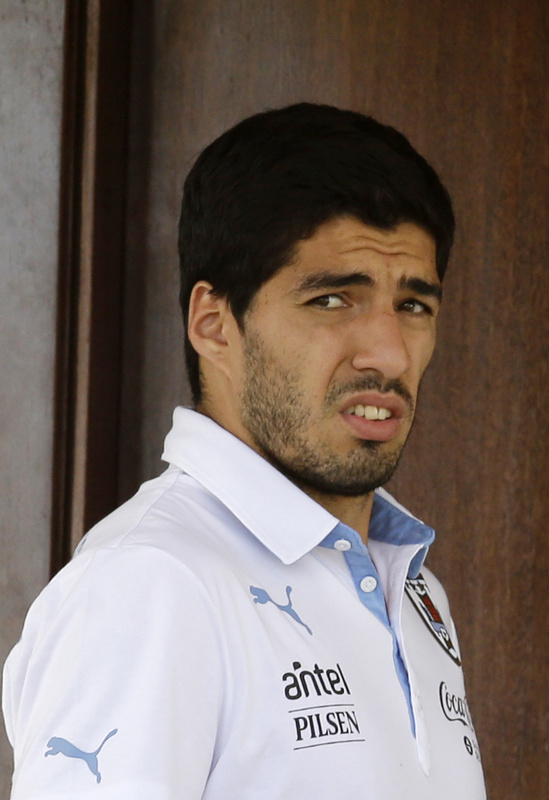 The four-month ban will sideline Suarez for the first two months of Liverpool’s season. He was also suspended for Uruguay’s next nine matches, which extends beyond the four months and rules him out of next year’s Copa America, where his team is the defending champion. Suarez bit the left shoulder of defender Giorgio Chiellini on Tuesday in Natal during Uruguay’s 1-0 win over Italy, an incident that went unpunished by the referee but was witnessed by fans around the world on TV. “Luis in the next few hours will travel to Montevideo to be with the rest of his family to recover,” federation president Wilmar Valdez told reporters. Suarez, 27, scored both goals in Uruguay’s 2-1 win over England, a performance that further enhanced a reputation that had gradually been rebuilt following a 10-game suspension for biting a Premier League opponent last May, and an eight-game ban for racially abusing an opponent in 2011. Suarez was voted the English league’s best player last season after a campaign void of any disciplinary issues.